EcoVantage Energy Inc. FAQ How do I wire my batteries for different voltages? How do I wire my batteries for different voltages? There are two major terms in battery wiring: series, and parallel. Parallel wiring keeps the voltages the same, while increasing the capacity. Parallel can be described as positive to positive, negative to negative. 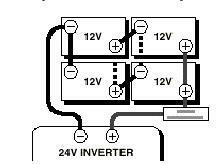 Here is an example of paralleling four batteries in a 12volt system. Series connecting increases the voltage in a system, while capacity of the battery bank remains the same. Here is an example of series connecting four batteries together to create a 48volt system, and a 24volt system. Then paralleling the 24 and 48volt banks with another 24 and 48volt bank to increase capacity.